A female centaur (a creature half-human and half-horse) enters a clearing in the woods, and picks some flowers. She is soon met by a male centaur, and the two then romance each other. They then seek parental consent for their union. After eating a cheese cake, a hobo falls asleep and dreams of a vaudeville show performed by bugs. Circus owner Flip entertains with balancing tricks and then tames an exotic beast. Winsor McCay classic that makes you feel that the filmmakers of THE LOST WORLD and KING KONG might have been influenced by this. A husband brags about eating a delicious rarebit but this food always gives him weird dreams. In the dream, the wife takes in a cute animal and soon after it just keeps eating and eating while getting bigger and bigger. The thing eventually grows to the size where it begins to terrorize the city. 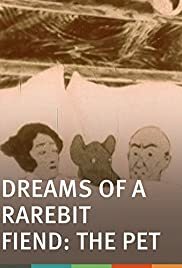 McCay made three different "Dreams of the Rarebit Fiend" films in 1921 and this here is certainly the best of the bunch. One could argue the creative issues seeing as how all three were pretty much the same story with different dreams but this here is so creative that you can't help but fall for it. The entire film has a very bizarre atmosphere working for it and a lot of credit has to go to McCay for coming up with such a strange looking animal. It's part pig, part dog and part teddy bear but it's certainly something impossible to forget. I thought the animation was a major step up from his previous films and just check out the scene where the animals is eating what appears to be beans off the floor. Just pay attention to the way the pile goes down as the creature eats them. Fans of McCay will certainly want to check this one out but fans of the surreal and bizarre should enjoy it as well.